Villagers working together to transplant rice seedlings. 1956. Rice seed is first planted close together in one flooded paddy and grows into seedlings that will be transplanted into many paddy fields. Until the 1960s, farmers transplanted rice by hand when the seedlings were about 8-10 inches tall. The schedule for flooding the paddy fields required the fields to be transplanted in a certain order, because the paddy had to be flooded and the soil worked into a soft mud to accept the rice seedlings. Villagers worked together to do the transplanting efficiently. A large group of villagers gathered in a long row across one flooded paddy, standing in the water and each carrying a handful of rice seedlings. Everyone planted one seedling in the row, and then stepped back one step and planted the next row. 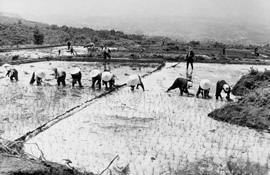 They could quickly plant one paddy field in neat, even rows, and then move on to the next paddy field. Transplanting was hard, backbreaking work, but it was also an occasion for singing and enjoying each other’s company as they worked together. Click on Pictures to see a close-up of transplanted rice seedlings.